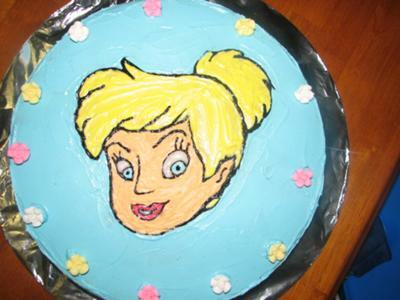 For this Tinkerbell cake, I used a 2 x vanilla butter cake that came with frosting. I made up to the instructions on the back then poured it in to a greased and lined 10" round tin. Cook until the cake springs back when pushed on top and the tester comes out clean. Then I used black writing gel to do the outline of Tinkerbell and features ex. eyes lips and hair. I then colored the frosting and and decorated the cake according to the picture. You can buy the sugar flowers from Coles or Woolies for around the outside. My 4 year old daughter thought this was absolutely wonderful.